Although gastropods and cephalopods both belong to the taxonomic phylum Mollusca -- more commonly known as mollusks -- that doesn't mean they're similar. With over 62,000 described species, gastropods are much more common, and include snails and slugs of all kinds. Cephalopods have just 650 to 700 extant species, including all octopods, squid and cuttlefish. They're more easily characterized by their differences than their similarities. Among the most obvious differences between gastropods and cephalopods are the habitats in which they live. 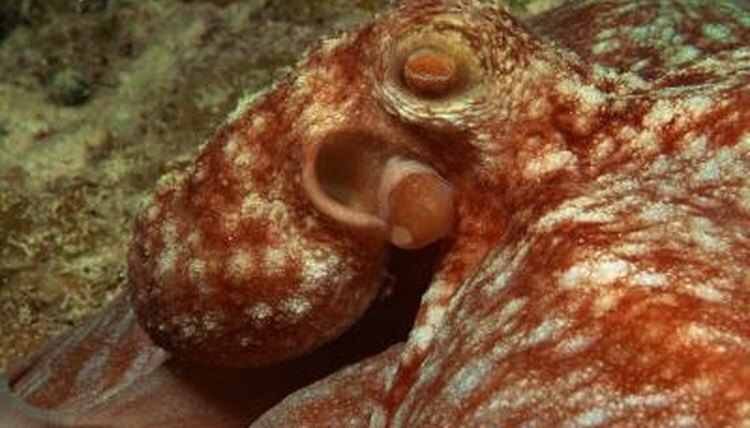 Cephalopods are strictly marine creatures -- they can only be found in the ocean. Gastropods, on the other hand, can live in a range of different environments. The majority of gastropods are terrestrial, meaning they live on land, but can also be found in the ocean and in freshwater lakes or streams. Cephalopods have much more specific diets than gastropods. All species of cephalopods are carnivores, meaning they live on animal foods alone. Their exact diet varies between species, but usually consists of fish, crustaceans, other mollusks and worms. Most gastropods are herbivorous -- or plant-eating -- although their feeding habits vary greatly between species. They can be detritivores, who eat detritus; grazers, who feed on grass; scavengers, who search for both plant and animal matter; browsers, who feed on leaves, barks and stems; or carnivores. All species of gastropods, expects for slug species, have hard, external shells to protect their internal organs. No cephalopods -- with the exception of species belonging to the taxonomic subclass Nautiloidea -- have external shells. It's thought that cephalopods evolved from certain types of shelled gastropods, which may be why some species -- such as cuttlefish -- still retain an internal shell. Gastropods and cephalopods have very different anatomical structures. The name cephalopod translates to "head-foot." Their basic anatomy consists of a head -- or mantle -- that contains all their internal organs, and feet -- often referred to as arms or tentacles -- which help them with hunting and propulsion. Gastropod means "stomach-foot." They're made up of a foot, which they contract to move around, and -- in most cases -- a shell to house and protect their organs.